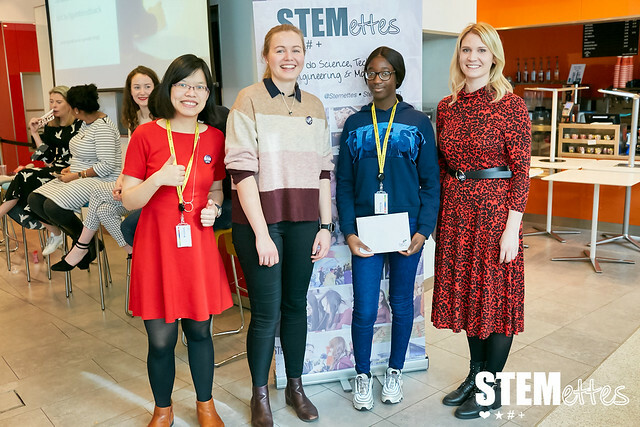 On Saturday 9th March, we were back at LGIM to host our very special International Women’s Day ‘Meet the Stemettes’ panel event for young women. LGIM is short for Legal & General Investment Management. At LGIM they handle money for millions of people across the world and use maths and technology to keep it safe, invest it and grow it for their customers. Each panellist introduced themselves, then answered lots of questions from our audience of young women and parents. Our panellists gave some great advice such as ‘Try different approaches in learning. There isn’t only one way!’. Sharing with young girls my experience at SAP, what SAP does, and how I become who I am today. In terms of impact, we had about 70 in attendance (including parents and guardians). 100% of attendees would like to come to another Stemettes event, and they gave the event an average of 9 out of 10. 100% left with improved awareness of STEM careers available. 100% had improved confidence in their STEM abilities. 100% left with an improved perception of the STEM world and 93% left with an improved network within STEM. Thanks very much to LGIM for hosting us, catering for everyone and providing their role models as panellists. We’ll be back to LGIM with a panel event for London soon. Join our mailing list to be kept up-to-date. If you’d like to host us let Event Stemette know.